How to get there: This trailhead is located in the south-east part of Switzerland. From the town of St. Moritz, travel north along Hwy. 27 in the direction of Zernez. Very shortly, you arrive at the small village La Punt-Chamues, where the road to Abulapass forks left in a narrow passage between two buildings. Take this road and drive up the hillside, then continue climbing in the valley until you locate the trailhead parking on your left hand side. There are signs for the trail posted on the right side of the road at the same location. If coming from the north, say Chur, then go south on Hwy. 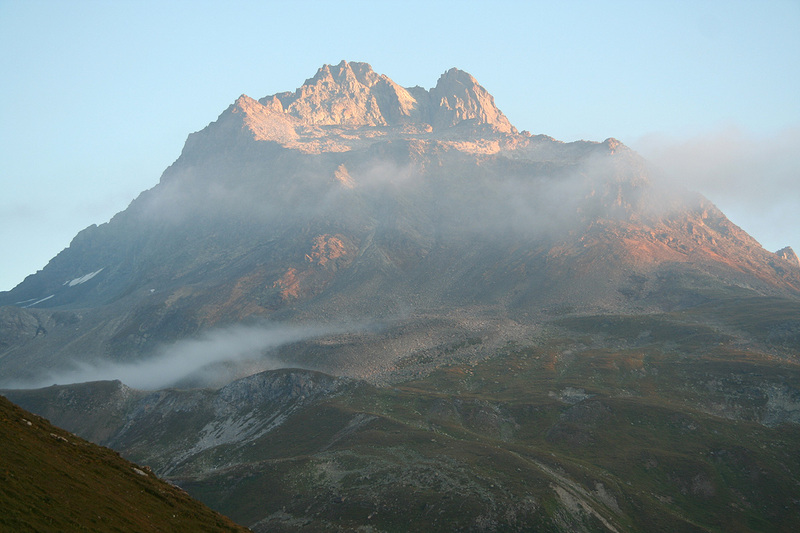 3 to Tiefencastel, then locate the road to Abulapass. Drive across the pass and a bit more than one kilometer further and locate the trailhead parking on your right hand side. The trailhead parking is located at N46:35.321, E009:52.367, elevation about 2250 meter. Hut hike: Cross the road and follow a short 4WD road up to some green pastures (cows). 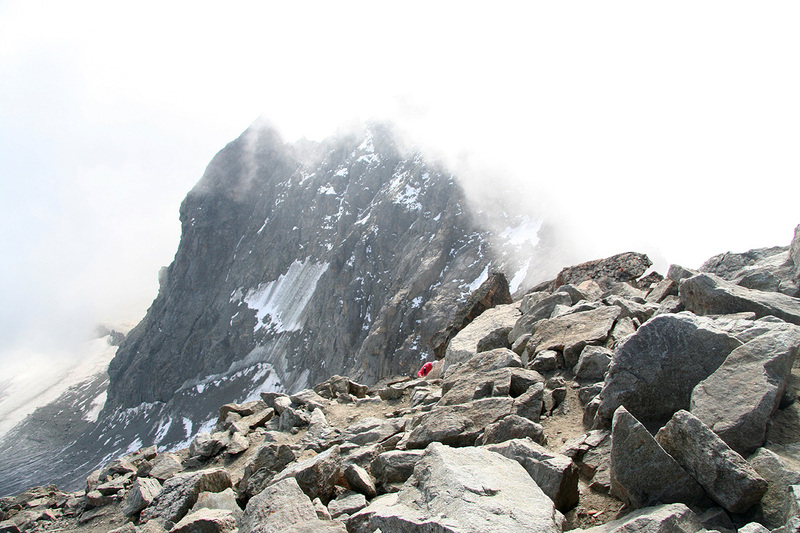 From here, the trail makes a long gradual traverse (right) to a distinct col called Fuorcla Gualdauna (approx. 2490 m). From this col you see Piz Kesch for the first time as well as the hut located across the valley. The very good trail runs left and contours around (a big U-shaped arc) while maintaining the elevation. Ascend the final slope to the ridge and the hut. This hut is called Chamanna d'Es-cha and it is located at N46:36.678, E009:54.186, elevation approximately 2597 m.
Summit climb: From the hut, head uphill along the broad ridge, first passing the building that is located just above the hut itself. This ridge climbs directly up to a somewhat level moraine area. Here, the well marked trail heads a bit more left (when facing uphill) as it gently climbs to a small col while passing to the right of a small pond. This col is located at N46:37.316, E009:53.407, elevation approximately 2937 m. Descend slightly on the other side, then traverse among rocks until you are below the main col in the ridge up left. Locate a very distinct and narrow gully coming down. Climb up here, in the gully itself or on good quality rock on its left side. This stretch is protected by a chain. The difficulty is (YDS) class 3 (scramble) without using the chain. 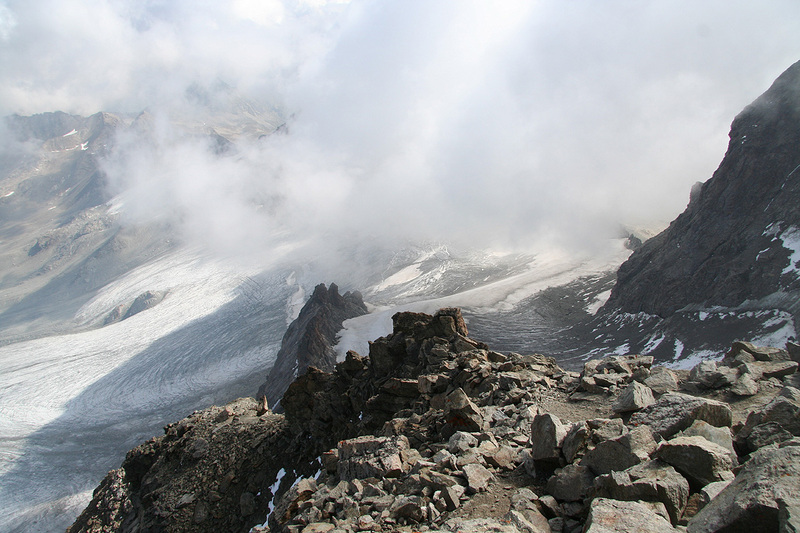 This col is named Porta d'Es-cha and is located at N46:37.435, E009:53.291, elevation about 3014 m.
From this nice location, you see the glacier below as well as the summit of Piz Kesch higher up and across. Make a note of the most natural route on the glacier, a wide arc to the left followed by a second arc swinging right. 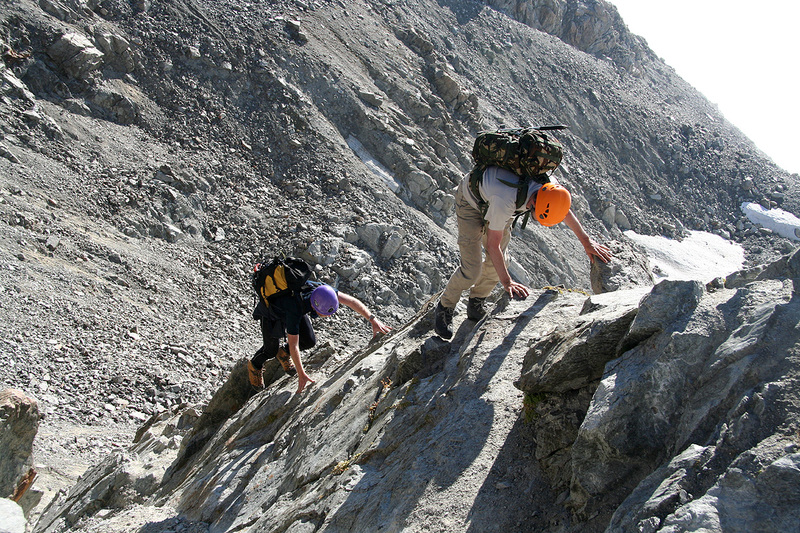 Descend to the glacier along a climbers trail. The slope is gravel and loose rocks, some care is called for if there are any climbers below you. Ascend a short stretch on ice, generally staying far left, in order to get onto the glacier. 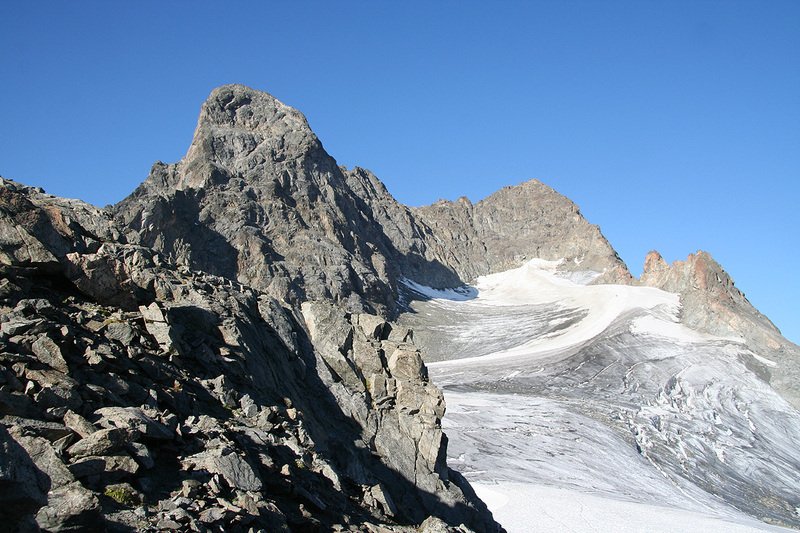 The route climbs very gently as you follow the best path towards the base of Piz Kesch. There are a few crevasses, but they tend to be small and one can typically just stride across. The slope has a more distinct uphill as you start the second arc, however, never steep. Proceed along the broad snow ridge, then exit right as soon as you have good access to an almost horizontal section of the (north-east) ridge of Piz Kesch. You are now at location N46:37.345, E009:52.510, with elevation 3228 meter. 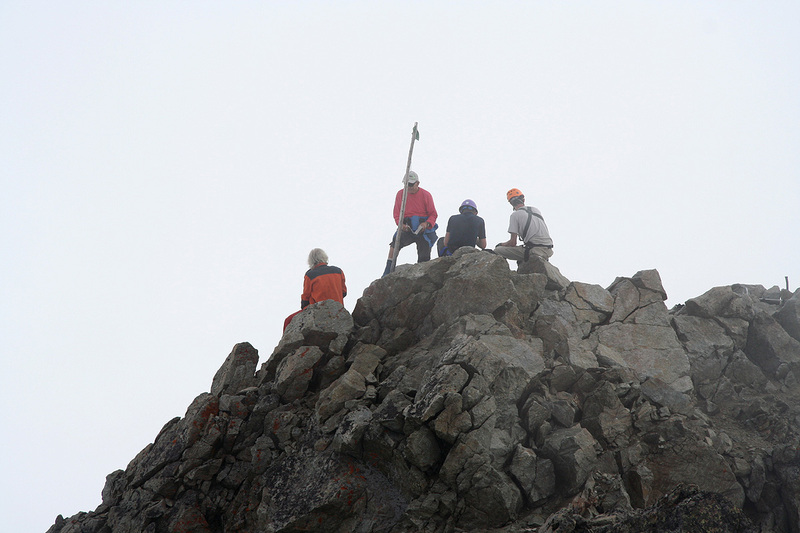 Initially, ascend up along the ridge, there are many small trails, the rocks are more stable along the top. 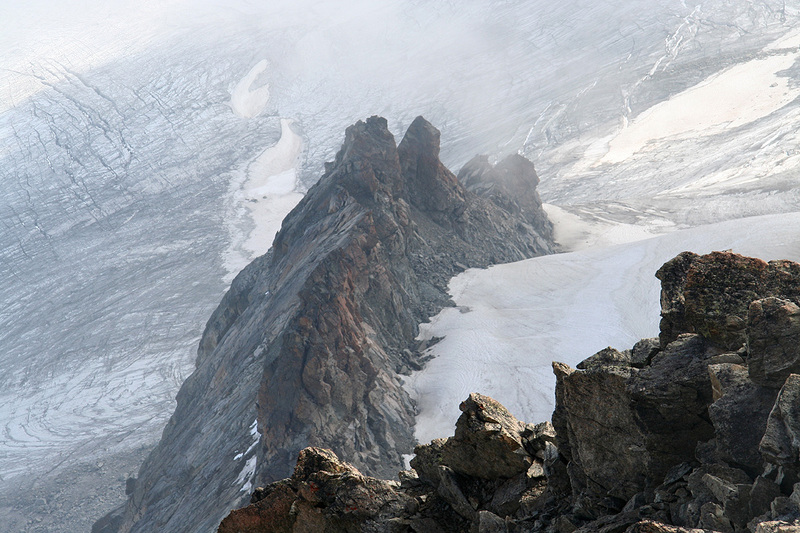 As the ridge gets steeper, traverse slightly left and enter a very distinct gully. This area is loose and there is some danger of rocks coming down if there are climbers above you. Scramble up this gully (YDS class 3), then exit left at its top. This exit will easily lead you onto a broad and gently sloping section below the cliffs higher up. Ascend this part following a climbers (zig-zag) trail. Move all the way right (facing uphill) as you complete this slope and locate a small trail that runs out on the right side of the main ridge. There is a small cairn just below the steep cliff marking this exit. This is the only way up that keeps the difficulty of the route at (YDS) class 3. 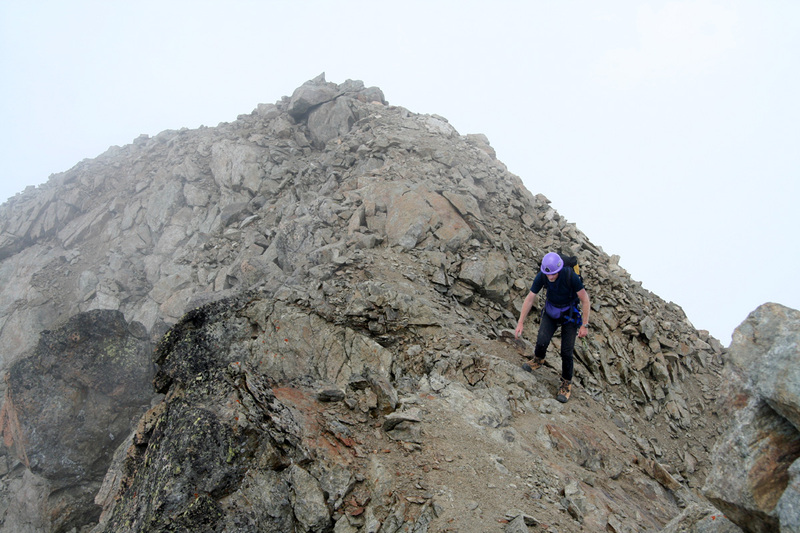 Traverse a bit out on this side, then scramble left (easy terrain) in order to regain the top of the main ridge. Follow uphill for a short stretch, then start a long, ascending traverse to the left across the face of the mountain. There is a pretty good climbers trail showing the way, with one uphill section following a natural gully. This traverse will take you all the way to the opposite ridge crest. Turn sharply right here and traverse more or less horizontally back, then gradually uphill on easy terrain to the summit of Piz Kesch. Note: This route stays as easy (YDS) class 3, actually mostly class 2+ (UIAA I). The initial gully is as steep as it gets, most of the route is walking rather than climbing. 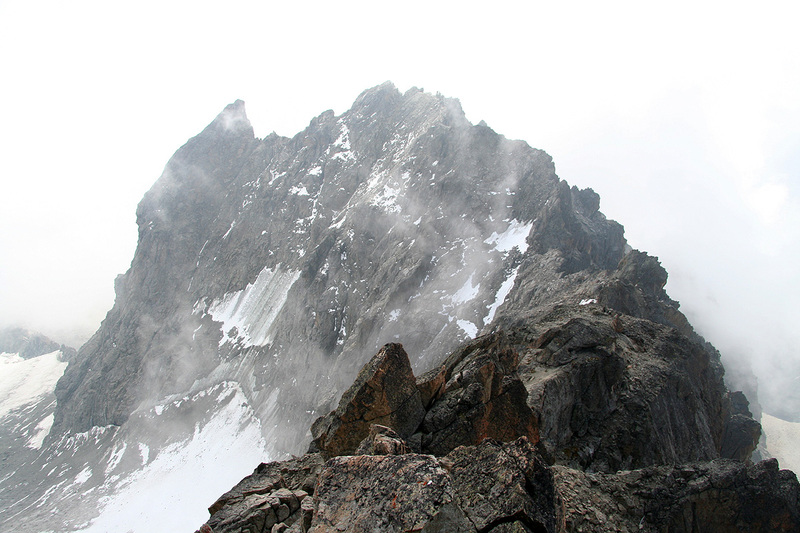 Many climbers fail to locate the (easiest) route as it exits out on the right side of the main ridge (described above). If you stay on the left side, you will encounter a single crux area where a 3-4 meter rock step is (YDS) class 4 (or UIAA III). Comments: After our extremely nice, but long day climbing Ortler, we had decided that Piz Kesch might be appropriate for the next day. I slept at a rather fancy hotel called "Castell" on the hillside overlooking the village Zuoz, while Andy and Rob slept in their rental car at the trailhead. I woke them up at about 0515, and by 0615 we were on our way along the trail. The hike to the hut took 1:15, and a 15 minute break for water and general rest was welcome. There was a party with mountain bikes at the hut, to me the trail certainly seemed better suited for hiking rather than bicycling, but times are changing..
We continued uphill and soon hiked into the clouds/fog. However, at the key saddle Porta d'Es-cha, we were again above the clouds and had a deep blue sky above us. From here, we had an excellent view of the glacier as well as the highest summit of Piz Kesch on the other side. The glacier was partly snow and partly ice. Crevasses were easy to detect and the overall hike to the north-east ridge was indeed very pleasant. We arrived at the lower section of the north-east ridge around 1000, time to leave crampons and ice axe behind. From here, we scrambled upwards as several teams (that had started from the hut) were coming back down. Rockfall can easily happen here and some care should be exercised in order to minimize this risk. Higher up, we headed up a route that had just been downclimbed by another party, and here we ran into the crux of this climb. I tried going right and got myself into a somewhat awkward position, Rob discovered a better move further left and helped out, while Andy followed easily. This was a (YDS) class 4 section and a rappel back down would certainly be the safer and easier way when descending. The rest of the ascent was mainly (YDS) class 2+ character as we traversed the entire face reaching the top of the main crest going south-east. From here, the remaining climb going back more north was easy and we arrived at the summit around 1110. We explored the ridge to its very end and determined that it was slightly lower at the end. There was a summit register, but no proper cross on this summit. We enjoyed the view as well as resting until 1130, then descended back down. On the descent, being a little bit ahead, I decided to explore the main ridge, then discovered that there was an easy route on the north side of the ridge just where we had the crux of the route when going up. 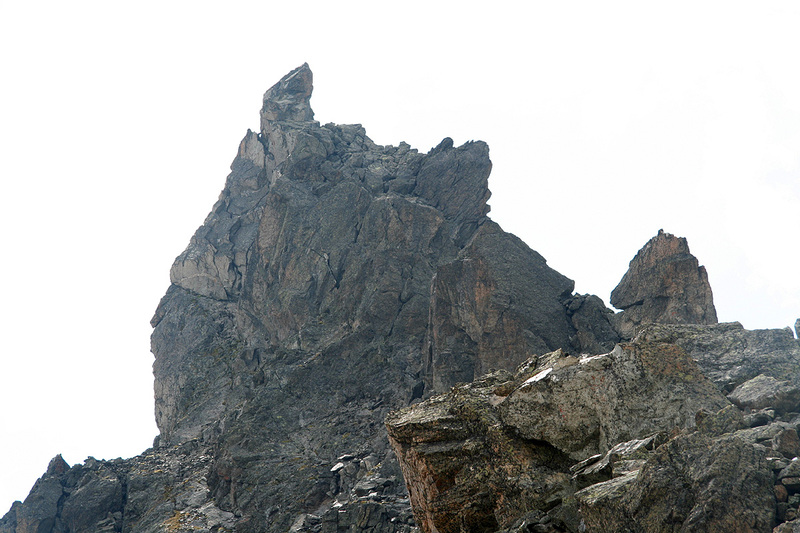 This route changed the overall difficulty of this peak to (a pretty easy) (YDS) class3. Arriving back at the place where we left our ice axe and crampons, a young and helpful guy came over and asked if these were my crampons. Upon confirming, he could tell me that Petzl had launched a recall, replacing this brand with a new design. The reason being that the attachment area of the front points could fail (likely only under heavy stress?) This was indeed good news and the day after arriving back in Bergen I exchanged my 4 year old crampons with a brand new set. 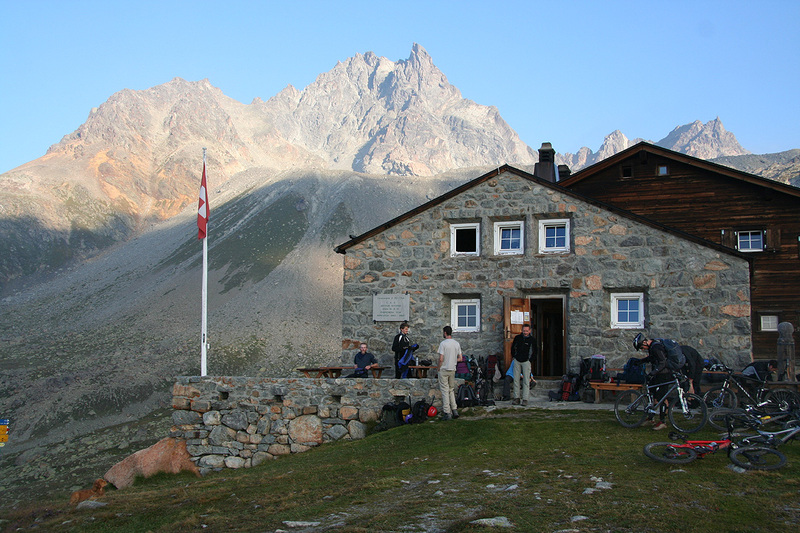 We reached the hut at 1430, a big beer and some apple cake tasted well. Departing at 1500, we reached the cars at 1600. 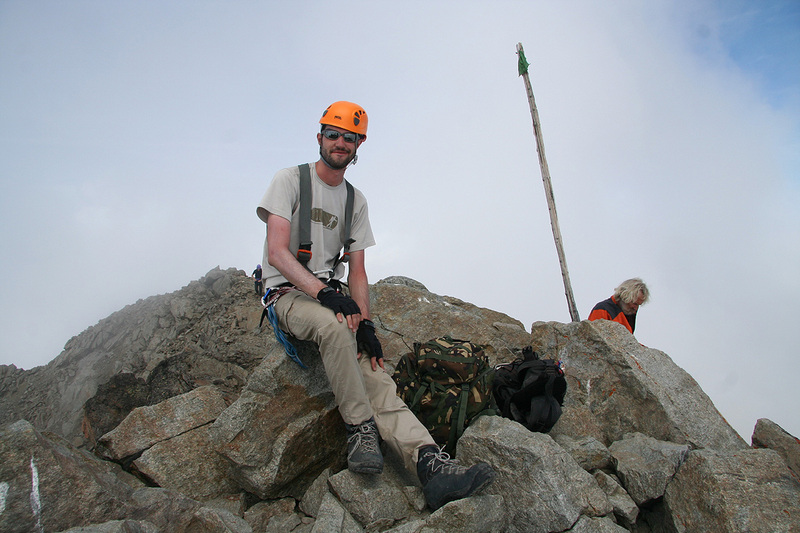 Here, our ways parted, I would head north to the base of Säntis, while Rob and Andy would drive south to Italy and visit a few ultra prominent peaks that I already climbed a few years ago. Many thanks are due to both Rob and Andy for excellent company on two very fine mountains. Piz Kesch, as seen from the trail. The highest summit is hidden behind. View back, from the first col above the hut. 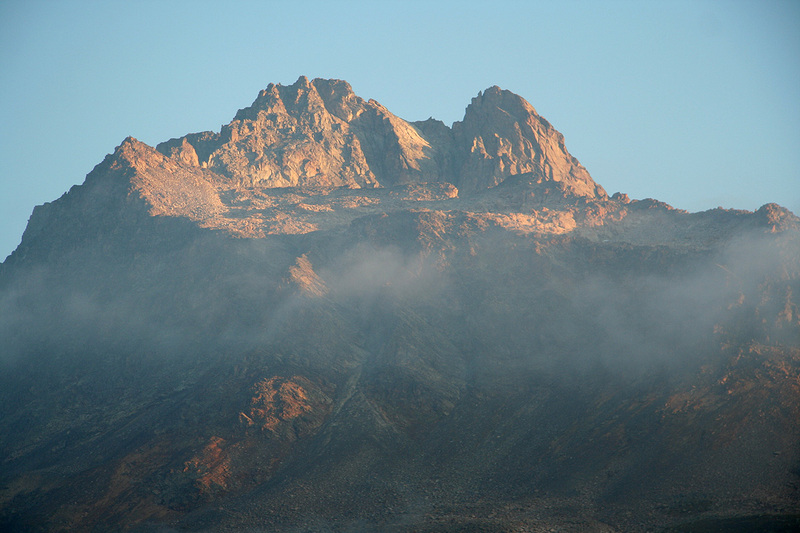 View along the crest, the summit in the mist is almost equally high. On the summit, Andy and Rob plus two unrelated climbers. 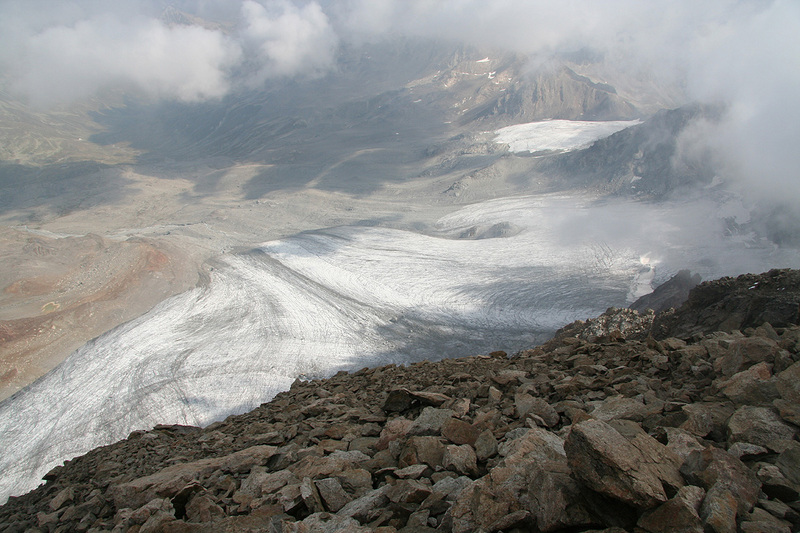 The glacier, as seen from the summit. The snow on the glacier, that we followed to the base. The beginning of the climb, started straight below here. 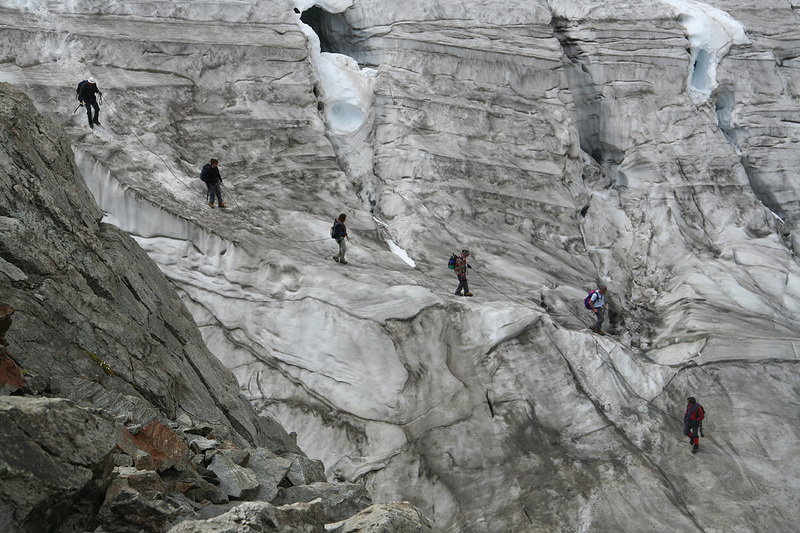 Climbers returning off the glacier.